To fit 19 inch (48.25cm) head. Hat is 11 inches (28cm) long from ribbing to crown. Mitts - 6.5 inches (16.5cm) around to fit hands up to 8 inches (20.25cm) circumference, and are 8 inches (20.25cm) long. 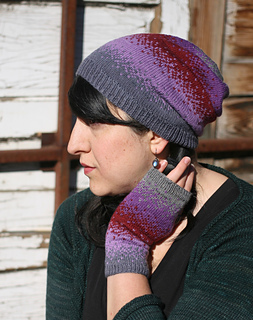 Speckled, almost pixelated colorwork blends the coordinating colors of a miniskein set into this slouchy hat and matching mitts. 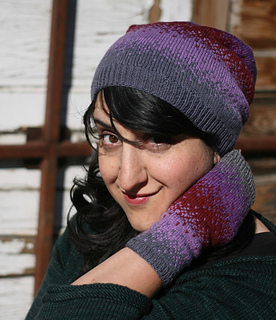 With ribbing to ensure a good fit, this set is as much fun to knit as it is to wear. Yarn: One Lorna’s Laces String Quintet Miniskein set, shown in Violin. 535 yds of Shepherd Sock in 5 colors. Gauge: 34 sts & 40 rounds = 4 inches (10cm) square in colorwork pattern on larger needles. - 6.5 inches (16.5cm) around to fit hands up to 8 inches (20.25cm) circumference, and are 8 inches (20.25cm) long. Needles: 2.5mm (US1.5) for ribbing, 2.75mm (US2) for the rest, or size needed to obtain gauge. Use your preferred method for small circumference knitting: e.g. double points, magic loop or two-circulars. Notions: 7 repeat markers, plus a different marker for the beginning of the round, tapestry needle for weaving in ends. Each String Quintet set contains different colors. Arrange your colors however you’d like, but consider contrast between colors when you do. If you have two similar colors, you might wish to keep them apart. Because this set has both colorwork and single-color sections, be sure to spread out your stitches on the needle and keep floats loose enough so that colorwork will block to the same gauge as the single-color sections. 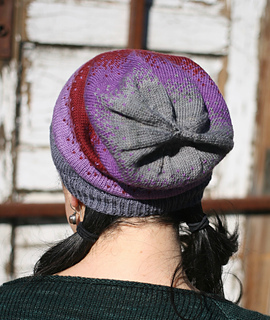 The newest color should be kept dominant (see colorwork tips above). For the hat I let floats go a max of 7 sts without catching, but for the mitts (where fingers could catch in a 7 st float) I caught them every 4 or 5 sts. 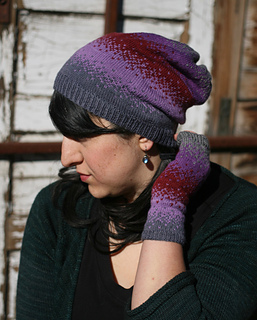 If you swatch for this set, I would recommend blocking your swatch with the yarns unbroken. That way you can unravel your swatch to use in the pieces. Yardage may be tight.